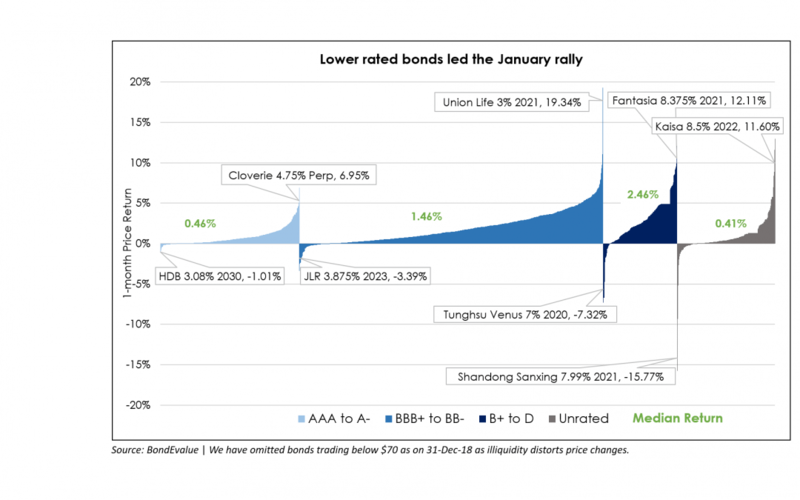 The new year began on a cheerful note with 87.7% of bonds in the BEV universe ending the month of January with a positive price return. This led to an uncrystallized mark-to-market gain of US$ 35.5 billion for US dollar denominated bonds in the BEV universe. Asian high yield issuance hit a 6-year high. One of the key factors that led to the rally in bonds was the Fed’s change in stance during the FOMC meeting on 29-30th January. Keeping interest rates unchanged, the Fed stated that it will be “patient in determining future adjustments to the target range for the federal funds rate”, being cognizant of the current economic environment surrounding the US economy. While US Treasury yields were on a downward trend in the last two months of 2018, they remained largely unchanged in January, hovering between 2.60-2.70%. 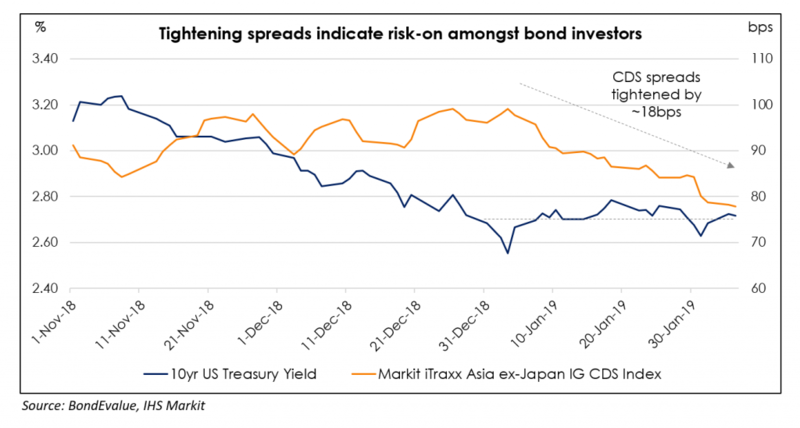 In contrast, credit spreads, as measured by the Markit iTraxx Asia ex-Japan Investment Grade CDS Index, tightened significantly during January. Tightening credit spreads coupled with a stronger rally in lower rated bonds indicate a ‘risk-on’ sentiment amongst bond investors. This can also be inferred from the flurry of successful new bond issues from high-yield issuers in January. Asia ex-Japan G3 currency issuance volume is at a nine-month high of US$ 28.9 billion. This was 27.2% higher than the monthly average of 2018, and 16.8% lower than the issuance volume of US$ 34.0 billion in January of last year. It is interesting to note that monthly issuance from high-yield corporates was at a 6-year high of US$ 9.1 billion. This can largely be attributed to refinancing needs of real estate issuers from China, as they face a wall of maturities from the debt-binge in the last few years. China accounted for 45% of the new issues in January. Other indicators that pointed to this very bullish month was the persistent over-subscription in new deals and the fact that almost all the bonds issued in January are trading over reoffer levels. January saw a number of deals from sovereigns, with Philippines keeping up with its tradition of being the first sovereign issuer from the APAC region. Large deals from Saudi Arabia and Turkey garnered strong response from investors with the bonds rallying on the secondary markets. Lestari Banten Energi tapped investor demand for project bonds with a US$ 6.875% bond due 2039, issued via a special purpose vehicle (SPV) LLPL Capital. The bond rated Baa3 (IG) by Moody’s received strong interest from investors, with orders totaling US$ 3.3 billion. The bonds are now trading at a significant premium to issue price on the secondary markets. This was only the third project bonds by an Asian issuer since 2000. State-backed Indian oil producer Indian Oil Corp surprised bond markets with a jumbo US$ 900 million 5-year benchmark bond, the largest dollar bond by a non-bank Indian corporate in 3 years. 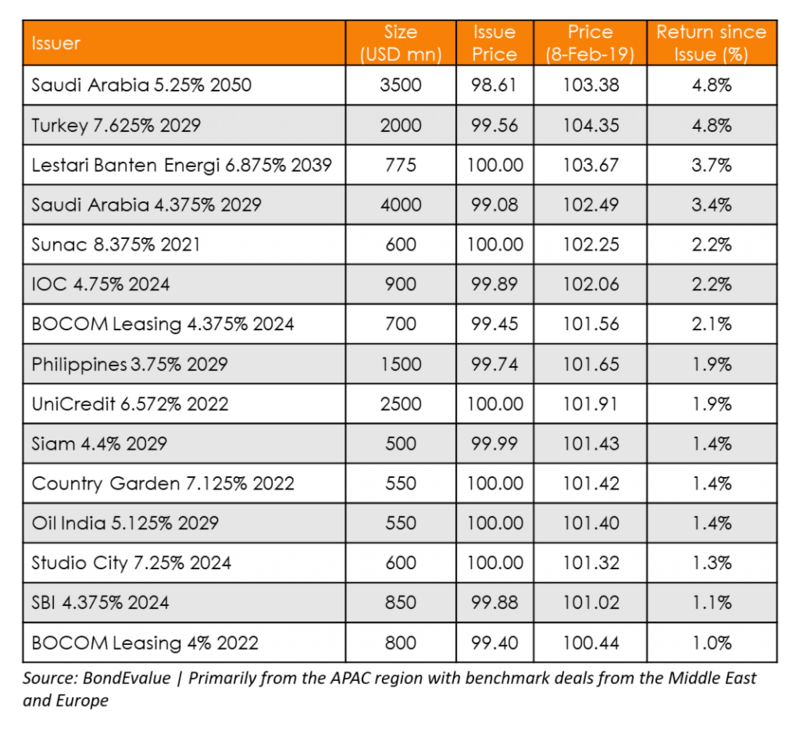 Strong demand led IOC to tighten pricing by 27.5bps to T+222.5bps, yielding 4.774% on issuance. 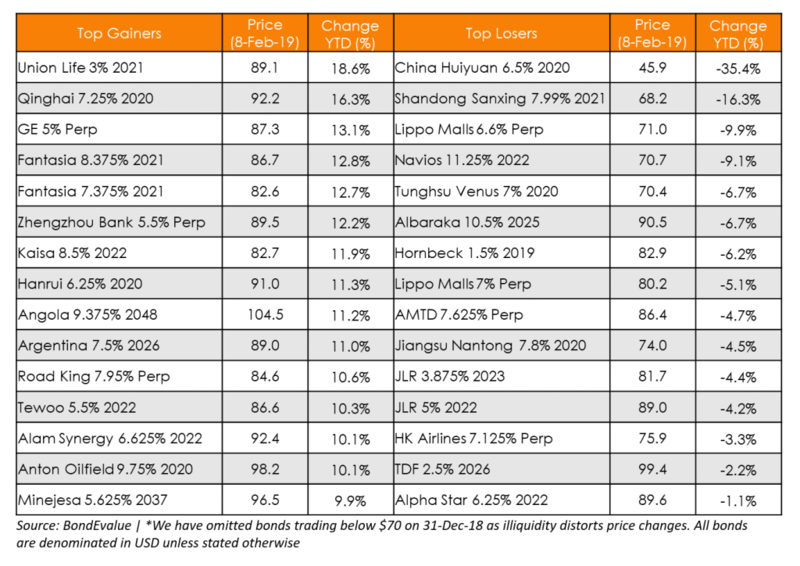 Chinese real estate issuers closed large deals this month, as they attempt to refinance mounting debt maturities. Evergrande, China’s second-largest property developer by sales, sold US$ 3 billion in a three-tranche deal with yields topping 10% for the bonds due 2022. This comes just a few months after Evergrande sold US$ 1.8 billion of bonds with yields as high as 13.75% at the time of issuance. General Electric’s bonds recovered in January after the American industrial behemoth reported fourth-quarter earnings. The lack of further bad news in the reported earnings led investors to believe that GE is on the path of recovery. GE’s 5% Perp bounced back from a low of ~74 cents on the dollar during the peak of its crisis in later November 2018. Lippo Karawaci and related companies OUE and Lippo Malls, all backed by the Riady family, continue to battle liquidity issues since an investigation by the Indonesian authorities began in November 2018. OUE recently put up the iconic US Bank tower in downtown LA up for sale, which it bought in 2013 for US$ 367.5 million. In an otherwise bullish market, prominent India linked high-yield names ran into a bit of a bother. The wheels came off the bus at Tata Motors, which reported the largest quarterly loss by an Indian corporate ever on account of a US$ 4 billion writedown. The massive writedown coupled with a 35% decline in sales from China during the nine-months ending December 2018 pulled Jaguar Land Rover’s bonds down, as the company scrambles to raise funds to meet upcoming bond maturities.